The Health Insurance Marketplace Open Enrollment period for 2018 started November 1, 2017 and will continue until December 15, 2017. 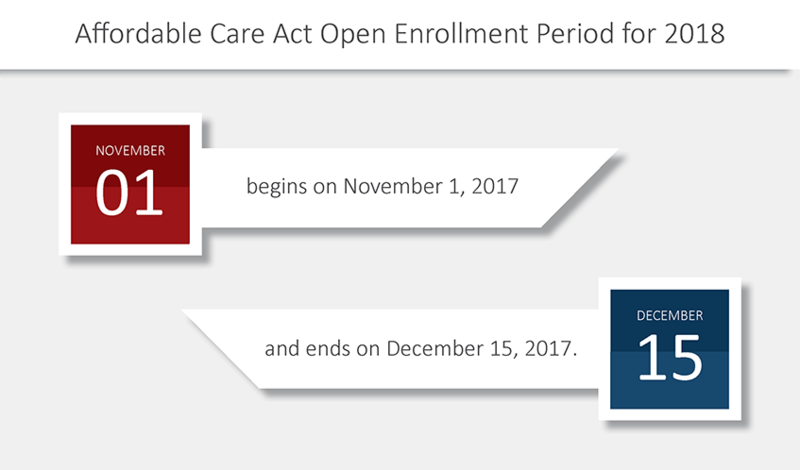 It’s important to note that the enrollment period previously ended January 31, so consumers now have a smaller window of time to find the right plan. 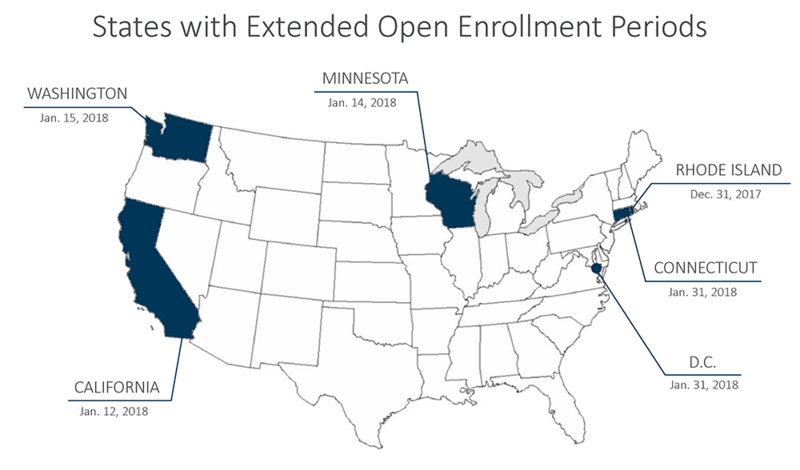 The ACA open enrollment period is slightly longer for Washington, California, Minnesota, Connecticut, District of Columbia and Rhode Island. Visit Obamacare Facts for more information on extended enrollment periods. This means, if you’re offering healthcare to your employees in 2018, they must submit their paperwork by the open enrollment deadline for the state they work in, or risk not having coverage during the upcoming year. Employees do have an opportunity to apply for health coverage outside of those dates in the event of major life changes, like having a child, getting married or moving. Consumers must now provide documentation of the event to qualify to buy a plan outside of the enrollment period. What are the 2018 deadlines for health insurance paperwork? Once you’ve identified if your business is required to offer health insurance, there are a few other important deadlines for employers to take note of. 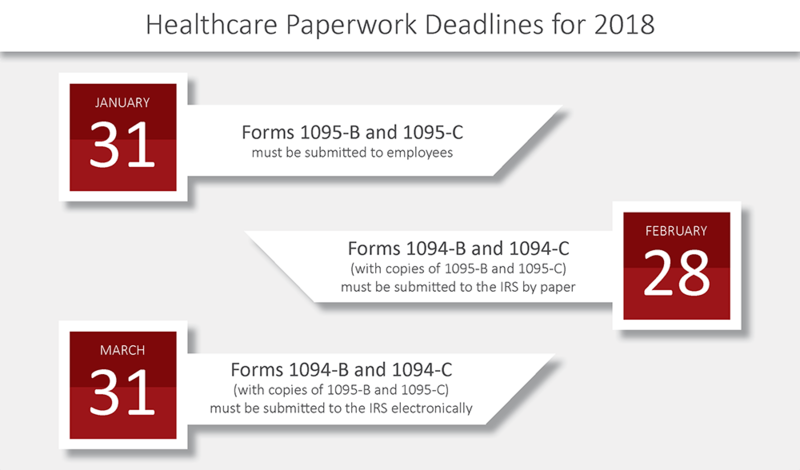 Employers are required to give employees who qualify for health insurance forms 1095-B and 1095-C by January 31, 2018. Anyone applying for health insurance by paper must submit forms 1094-B and 1094-C with copies of forms 1095-B and 1095-C to the IRS by February 28, 2018. Anyone applying electronically must submit the same forms by March 31, 2018. Starting in 2020, the ACA will impose a federal excise tax on high-cost health plans, known as ‘Cadillac’ plans. The tax will be implemented in hopes of slowing the rate of growing health costs, and to help finance the expansion of health coverage across the country. These ‘Cadillac’ plans generally offer the most generous level of benefits, with low or no deductibles. Proponents of the tax believe such generous health plans promote the overuse health care services, like unnecessary tests and hospital visits, which in turn raises healthcare costs across the board. But some plans are more expensive not because of the considerable benefits, but rather, because of an employee’s health status or age. The 40 percent excise tax will only be assessed for health care plans that exceed $10,200 for individual coverage and $27,500 for spouse and family coverage. Healthcare issuers and sponsors will have to pay 40 percent of any dollar past the ‘excess’ amount. Certain employers who employ a large number of older workers, women or people in high-risk jobs will have higher caps so as to lessen some of the financial burden of the excise tax. The tax was originally set to begin in 2018, but in December 2015, Congress signed a two-year delay to start the tax in 2020. The changes also included a revision that make Cadillac Tax payments tax deductible for employers.